Nothing makes me crabbier than fall. That cheerfully crisp weather, that can-do spirit that forces you off the porch and into some useful activity–it’s all too horrible to contemplate for very long. This year, though, good news has buoyed me up, helping me to face fall’s dreadful enthusiasm with a sense of hope: The Louisiana shrimpers are headed out into the Gulf again. For me, the Gulf oil spill has loomed all summer like . . . well, like the black oily cloud it is, seeping into the fragile marshes, threatening the livelihoods of shrimpers and fishermen even more than cheap seafood from China, oozing into delicate marine life and causing damage we may not fully realize for years. Still, earlier this week the shrimpers were out on the water again. They didn’t catch much. But there’s a little hope. To celebrate, I’m offering this soup recipe that I developed at the beach, using these gorgeous shrimp from the North Carolina coast, caught the same day they were served. Fred’s little camera doesn’t begin to do them justice. This dish is a lot less complicated than it looks. If you can boil water, you can make the shrimp stock, and it cooks while you prepare the other ingredients. Besides, there’s almost no way to mess up the combination of fresh corn, squash, and shrimp–a hearty yet delicately flavored combination that may well be the perfect summer dish, just in time for summer to end. You can, of course, cheat by using frozen shrimp and corn and substituting water or chicken broth for the shrimp stock. But you’ll regret it. And you need to help the shrimpers get back out there. Begin by making the shrimp stock. 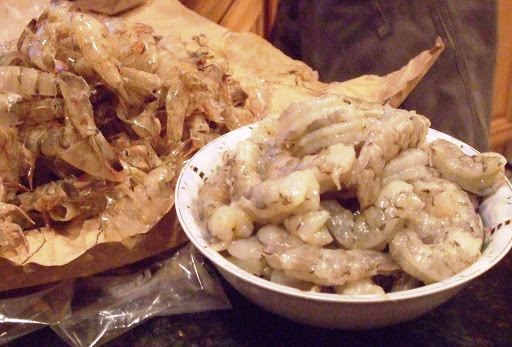 Place shrimp peels and tails in medium saucepan. Add enough water to cover by about 1 inch. Bring to boil on high heat. Reduce heat to medium low and simmer for about 20 minutes. Drain stock into bowl, discard peels and tails, and set aside. While stock is boiling, sauté onion in olive oil in large pot on medium high heat until translucent. Add garlic and jalapenos and stir. Add squash and sauté until tender, about 5 – 10 minutes. Remove from heat. Pulse in food processor until very finely chopped. Return to pot. Add corn. Cover with shrimp stock and increase heat to high; add water just to cover if there is not enough stock. Bring to boil; reduce heat to medium low. Add evaporated milk, cover, and simmer until corn is tender. Cooking times can vary significantly depending on the type of corn you use, anywhere from 5 to 30 minutes; taste periodically until the corn is tender but not starchy. When corn is cooked, reduce heat to lowest possible flame. Add shrimp and cover; cook about 3 minutes or until shrimp are cooked. This entry was posted in Fish and Seafood, Soups, Vegetables. Bookmark the permalink.